Ryoto Murata, makes his second defence of his WBA Middleweight title against American Rob Brant at the MGM’s Park Theatre, Las Vegas, Saturday 20th October. Murata (14-1, 11 KO’s) won the middleweight crown after winning a rematch against Hassan N’Dam Jikam winning by TKO in round seven in October 2017. This rematch came about after they both fought for the vacant title and Jikam won a controversial split decision, when most thought Murata had won. Murata defended his belt for the first time in April against Italian Emanuele Blandamura winning by 8th round TKO. During the press conference, Murata was asked about facing GGG or Canelo and replied, “Everything will happen after the result of this fight, so I’m not thinking ahead. I am looking forward to getting the victory on Saturday. “I had a great training camp, and I am going to put everything out in the ring that I trained with. I am very prepared and very confident. Brant (23-1, 16 KO’s) has won the WBA-NABA Middleweight title and WBC Continental Americas Middleweight title while he was on a 21 fight win streak. Brant entered the first season of World Boxing Super Series where he faced German Juergen Braehmer in the Super Middleweight division Brant suffered his first and only defeat losing by unanimous decision. Brant returned to middleweight and defeated Colby Courter by 1st round KO in March and feels confident ahead of his fight against the Japanese superstar. In the co feature bout Maxim “Mad Max” Dadashev defends his NABF Super Lightweight belt against former world champion Antonio DeMarco. Dadashev (11-0, 10 KO’s) won the belt in his last outing against Darleys Perez in June by TKO in the 10th round. The 28 year old Russian takes on a veteran in DeMarco (33-6-1 24 KO’s), the Mexican has won his last two fights having lost beforehand 3 in a row including losing his title to Jessie Vargas back in 2014. Dadashev said at the press conference, “My opponent is a former WBC champion. Of course, he has really good experience and is a smart fighter. That’s it. But I’m also strong. DeMarco has his eyes on becoming a world champion again. “I’ve been through this before and I’ve seen this before. It’s truly a pleasure to be here. Also on the card is popular Irishman, Michael Conlan who makes his Las Vegas debut. Conlan has been on a bit of a tour since turning pro with Top Rank, with fights in New York, Belfast and Australia. Conlan headlined a show in his home city, Belfast last time out and won comfortably against Adeilson Dos Santos winning by unanimous decision. Conlan takes on Italian Nicola Cipolletta in the featherweight division. Conlan is looking forward to his Vegas debut. Conlan on his trainer Adam Booth. Conlan, who lost controversially as an amateur in the Olympics is looking to face his old for Vladimir Nikitin who also appears on the card. 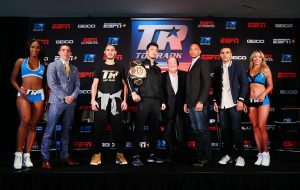 The event will be streamed live on ESPN+ in the U.S and Boxnation in the UK.